The name or term "G.I. Joe" refers to more than one character or idea. For a list of other meanings, see G.I. Joe (disambiguation). G.I. Joe is a 2009-2011 ongoing comic series published by IDW Publishing. The book tells the story of G.I. Joe's initial encounters with, and then burgeoning war against, the terrorist organization Cobra. The story follows G.I. Joe as they first learn about Cobra, suffer attacks, and retaliate. Whilst the two groups fight a secret war across the globe, Cobra's high-ranking members vie for power and control, with figures including the Baroness, Destro, and Dr. Mindbender all coming to blows with each other. The overarching plot for the series revolves around Destro's M.A.S.S. Device, a revolutionary teleportation system with the potential to give Cobra the power to dominate the world. 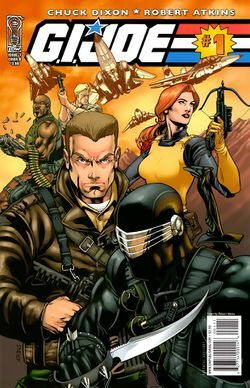 The series is written by Chuck Dixon, with art duties mostly shared between Robert Atkins and S.L. Gallant on a rotating basis. Alex Cal draws for a three-issue stint, whilst Allan Goldman assisted Atkins on the final issue. Andrew Crossley is permanent colorist for the book. The one-shot G.I. Joe: Special was written by Brian Reed with art by Joe Suitor. Contains the story "One Word" from issue #0 and issues #1-6. Bonus material includes a cover gallery and the bonus material from issue #0: Robert Atkins' designs for several characters and an interview with writers Chuck Dixon, Larry Hama, Mike Costa, and Christos Gage. Bonus material includes a cover gallery and character designs by Robert Atkins. Contains issues #13-17 and Special - Helix. Contains the story "One Word" from issue #0, issues #1-13, and Special - Helix. Bonus material includes a cover gallery.